Welcoming guests to its elegant Virginia accommodations since the 18th century, The Omni Homestead Resort is known for its Southern hospitality and refined charm. While outfitted with modern conveniences, the resort has maintained a historic charm, showcasing its heritage through hand-selected artwork, history tours, and architectural integrity. Surrounded by the Allegheny Mountains, the resort offers a magnificent setting to enjoy indoor and outdoor activities all year long. 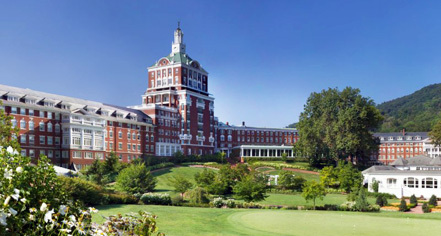 Boasting 483 distinctive guestrooms and suites, championship golf courses, and the largest hot springs in a Virginia hotel, The Omni Homestead Resort affords a truly memorable experience, two centuries of history, and inspired, genuine Southern hospitality. To celebrate the 250th anniversary of The Omni Homestead, pastry chef Oscar Bonelli and his team created and served a different cake each day in 2016 during the Afternoon Anniversary Celebration which began at 2:50 p.m.
Woodrow “Woody” Pettus at The Omni Homestead Resort was awarded Ambassador of the Year (Quarter Century of Service) for the 2017 Historic Hotels Awards of Excellence. 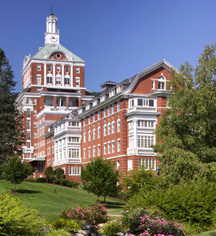 The Omni Homestead Resort, a member of Historic Hotels Worldwide since 2013, dates back to 1766. The original hotel was built by Captain Charles Bullet on a land grant given to him for his service in the French and Indian War. He chose the site because of rumors he heard during the war that the waters there had healing powers. Airport Transportation: Transportation Service to and from the Roanoke Regional Airport, surrounding airports and Amtrak can be arranged by calling The Omni Homestead Resort Activities Department at (800) 838-1766, option 3. Fees apply and advanced reservations are required. If you need transportation inside of three days of your arrival or departure, please call The Omni Homestead Resort Transportation Department directly at (540) 839-7711. Cancellation Policy: Cancellations within seven days will be charged one night's room/package rate, tax and 15 percent daily resort charge. If you do not show up on the first night of your stay, all activities and dining reservations for the entire stay will be cancelled. Cancellation policy is subject to change based on the package booked and seasonal periods. Deposit: A deposit of the first night's room rate, daily resort charge, and tax will be taken at the time your reservation is made. This deposit is fully refundable outside of seven days prior to your arrival. Deposits for all holiday time periods are fully refundable outside of 21 days prior to arrival. Early Check-In/Late Check-Out: If you arrive prior to 4:00 p.m., you may check your luggage with the bell desk and enjoy our resort amenities until your room becomes available. Late check-out may not be available, depending on availability. Hotel/Resort Fees & Taxes: A 15% resort fee applies. Additional taxes may also apply to booking: 5.3% state sales tax, 4% county occupancy tax. An 18 percent service charge is added to any spa charges incurred for spa attendants. The room rate and daily resort charge are subject to governmentally imposed fees and taxes. Occupancy Restrictions: Varies by room type. The largest unit available on-property can accommodate eight (8) people. Parking: Valet parking is $10 per night. Payment: All forms of payment are accepted. Payment is required at time of booking. Visa, MasterCard, Amex, Discover, and Diners Club International are accepted. Pet Policy: Service animals: Please contact hotel. Pets allowed: No. Rollaways: Available upon request; $15 plus tax per night. Smoking Policy: All rooms are non-smoking. A $150 daily cleaning fee may be applied to any room in which smoking occurs. Transportation: A complimentary resort shuttle is available. Welcoming guests to its elegant Virginia accommodations since the 18th century, The Omni Homestead Resort is known for its Southern hospitality and refined charm. Learn more about the History of The Omni Homestead Resort .